Dragoslav Sobotka is building engineer and a retired colonel, of Czech descent. He attended the elementary school at Užice, where his father was a railroad engineer, building the famous "Sargan eight". Since 1935. he's a member of Academic aero-club. 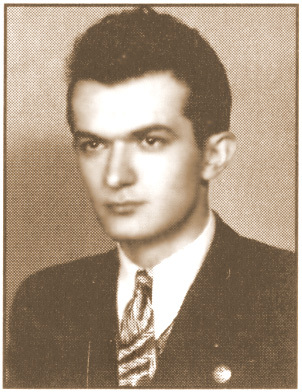 He was a secretary and cashier for mentioned club in 1936., and as a student he was a secretary of Air-sailing school on Zlatibor from 1936. to 1940., where he become certified air-sailing pilot. On the Internation airshow held on 1938. in "Staro sajmiste"(Belgrade, Serbia), Sobotka was involved as organizer and consultant. He participated in Yugoslav People's Liberation War(Yugoslavian Front of World War II), and after the liberation of the country he was invloved in building and designing many important civilian and military objects. His life acheivement is the project of undergorund airport "Zeljava" near Bihac (Bosnia-Herzegovina), one of the biggest of its kind in Europe (also it was 2nd such airport ever built in Europe..1st one was airport in Sweden). 91 years old he's now living in Belgrade.